With the Town Hall on “Diversity, Equity, and Inclusion” coming up this week at DUSP, lessons for MIT were on my mind in two breakout sessions in particular at the Facing Race 2014 Conference. The first was led by three wonderful people from the Interaction Institute on Social Change, where DUSP’s own Ceasar McDowell is President. The main idea of this interactive workshop entitled Using Systems Thinking to Address Structural Racism is this: when we use systems thinking we can more clearly understand the invisible underlying structures, mental, and values that create the visible events and patterns that shape our society in order to identify places to intervene with deeper and more lasting impact. 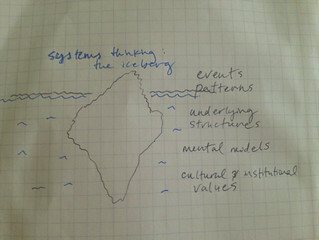 The organizers introduced an “iceberg” metaphor, to help us understand how systems thinking opens up a deeper analysis. While we can only see the above water portion of the iceberg, there’s much more going on below the surface. • The event: shooting of John Crawford III in an Ohio Walmart. • The patterns: Over-policing of and violence against black men and boys in America. • The underlying structures: The reliance on a police state; the training that policemen get regarding race and violence; etc. • Cultural and institutional values: white supremacy and even more fundamentally, a belief in a hierarchy of human life. What does this model help us see when we apply it to higher education and DUSP? Our Town Hall comes out of students identifying visible events and patterns: lack of diversity in terms of race, class, geography, nationality; lack of discussion about equity issues in the core curriculum, and more. But what are the deeper, more complex things (the underwater things) that are creating these outcomes? I hope we can brainstorm these together so we can better understand the complex system we are a part of and work to change it at a more structural level. Another panel also dealt with higher education, entitled “The Pipeline from School to Economic Opportunity”. This discussion, led by Sharon Davies, Marc Nivet, and Van Jones, discussed how exclusive our mainstream educational institutions are — and how they are not serving so many black and brown American youth who are, as Van Jones put it, low opportunity and high potential. His initiative, called Yes We Code, helps young people of color break into STEM career fields, which is overwhelmingly white. Applying the systems thinking framework, we see that structural racism, mental models of “who belongs” at places like MIT, and deeper values about who deserves wealth and power are all wrapped up in the institution we are a part of. If DUSP seeks to address pressing issues facing the youth of our cities, we should be thinking about these dynamics and seeking to partner with MIT’s efforts more broadly. Could we partner with organizations like Yes We Code to create pathways of opportunity? What would a more structural-level intervention look like that might address inequities in college admissions/STEM fields? In fact I learned that Van Jones is a fellow at MIT’s Media Lab. I hope DUSP can see something like this as an opportunity to create partnerships that would be beneficial for students within our institution and beyond. Post and drawing by Danya Sherman.